The daily volume on the SPY to this point is at 162 million shares, half the daily average of 333 million shares traded. The market continues to move on diminishingly marginal trades. research at J.P. Morgan, in a note to clients. Lets not forget about the carry trades that were going on when oil was at 35 dollars either. Lotta tankers out there with stocks. Perhaps drop off in oil you mentioned earlier will come to light soon. most of Europe is on holiday bro..
doesn't anybody remember the Lottery Uprising in Albania and the massive pyramid scheme that brought down their economy. The post on SPY volume seems to dovetail nicely with the earlier posts on the quants. I'm sure your predictions are 100% accurate. It's hard to make public calls my friend but easy to criticize. Maybe you can ask TD for a special section on this site to include your predictions. Some bears at CLSA like Russell Napier are calling for spx to run to 1200, and then a fall to 600. 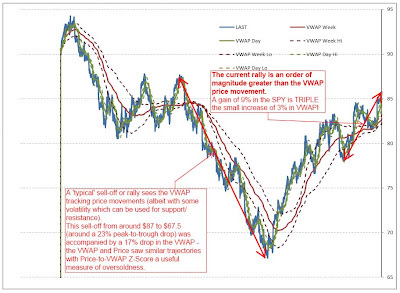 "A gain of 9% in the SPY is triple the small increase of 3% in VWAP"
I hope you took advantage of the opportunity handed to you at 860.
perhaps some of us anonymice might also want to take some lessons in eloquence as well. What's with this VWAP fetish. Is there something abnormal going on or are you just talking about something you don't understand? VWAP is always going to lag during a trend, up or down. I think folks are just hanging their hat on something that means nothing here. I wish there was a ZeroHedge for dummies section. I have no idea what any of this mean. Hey fellow Anonymous peeps...at least ZH ALLOWS and DOES NOT CENSOR your posts...Go over to "Carpe Diem" and try to dissent, see what happens. ZH is spot on...knows what he's talking about, too much sheeaat behind closed doors. I've lost my shirt trying to get to the bottom of FAZ and SRS. According to the recent related post, SRS would soar past 250 if D-Day were to occur. How is that possible? If the underlying index were to go to zero in a day (very unlikely), SRS would increase from its current value (around $30) 200% or end up around $90. It is, in theory, a no brainer that low volume on strong rally will result in a correction back to the lows. However, the outstanding variable remains the banks "fantastic" earnings and the government's "fantastic" moves to crush the bank illiquid market. That said, I don't see markets correcting. I do see that poor economic news, especially in unemployment and in housing, will lead the markets lower. It's a necessary requirement.